I LOVE New Year’s Resolutions. I know lots of you hate them but I LOVE making them. I hardly ever fulfill them but it’s still fun making them because the whole year is new and filled with possibility. Last year, I was upset to get sidelined by plantar fasciitis so that I couldn’t run the Honolulu Marathon in December as I’d planned. My head and spirit weren’t in a good place for much of last year, which affected my work, and to cope, I slipped back into bad eating habits while I was under deadline for books. I gained 5-8 pounds over the year and felt like a gigantic blob sitting in my work chair. My New Year’s Resolution is to lose 30 pounds and train for the Honolulu Marathon in December 2014! I want to stop snacking while I work because I’ve gotten used to having something in my mouth as I’m typing, and I don’t think that’s a good thing. Instead, I’d like to get up from my work, have a snack at the table, and then return to my work. I actually started my resolution early and restarted my exercise in late December. My plantar fasciitis flared up again, but I just got a new book, The Trigger Point Therapy Workbook, which was recommended by some people on a forum board on SparkPeople.com. I started massaging my plantar fasciitis trigger points yesterday, and I’ll see if it works to get rid of my plantar fasciitis, or at least help me to control it. I started back up on SparkPeople.com, too, for accountability and to track my food and fitness. If you’re there, add me as a friend! If you’re not on SparkPeople, join up! It’s really great and it’s free. I joined a few reading challenges on Goodreads.com, and as for writing, I’m participating in two novella box sets releasing next year with a bunch of other Love Inspired authors. We’re calling it the Inspy Kisses line. The box sets will include original novellas from each of us, and mine will be romantic suspense. Prelude for a Lord comes out in July. It’s a Regency romance I’m releasing under a pseudonym, Camille Elliot. I’m super excited about this because I’ve loooooooved Regency romance since I was in high school, and this is the first time I’ve written one. I love these characters and hope you’ll love them, too. If you guys are on my email newsletter, I’ll be sure to send out an email when these new books are available (I only email when I have a new release, 3-4 times a year). To join my newsletter, go to http://www.camytang.com/ and look for the purple chair. So there’s my goals for 2014! How about you? Camy, a Regency, that is exciting! I'll be sure to watch for it. I have a question for you. If a reviewer picks up that particular book how do you feel if your pen name and real name get mentioned in the review? I never thought about it before, that the author should be asked if a reviewer knows about both names. Obviously you've mentioned it here so it isn't a state's secret but it made me curious. I'll pray for you about the health/weight/marathon plan. That's a good question! I personally prefer it since I know a lot of my romantic suspense readers also enjoy historicals and would be interested in my Regency. Thanks for the prayers! That's pretty flipping awesome, Camy! I will definitely keep an eye out for when that book comes out. PS I'll keep you in my prayers. I hope you get a job soon! I'll be praying for you! Let me know if you find one! And thanks for praying for me! How did you come up with your pen name? I love the cover of the book. I just striving to be better than I was last year. I think that's a great resolution! I've seen several authors with pen names for different genres ... Though you didn't have a pen name to separate your contemporary romance and romantic suspense novels. Is there a reason why you decided to go with a pen name for your historical novel? Mostly because it was a really large leap from romantic suspense to Regency romance. :) My publisher suggested it. That makes sense. 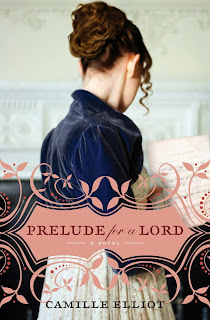 I can't wait to read Prelude for a Lord --the Regency era is one of my favorites-- plus the story sounds really unique! Thanks! I hope you enjoy it! I loved writing it! Regency is my favorite historical era to read!